Following the 1881 bankruptcy of U.M. Fondain, Eugene Ducretet took over Fondain's tinfoil phonograph production. Ducretet (1844-1915) was already a highly respected inventor and manufacturer of scientific instruments by the 1870s, and later became famous for his work with electronics (he is known today as the "father of radio in France"). Ducretet's phonographs bear an unmistakable resemblance to those of Fondain, however there are significant differences as well. The base is more squared in shape, while the upright supports have straight edges, unlike the curved supports of the Fondain. The brass face plate is attached with knurled screws. All Ducretet tinfoils were finished with the same bronze-colored lead paint as the later Fondain machines. 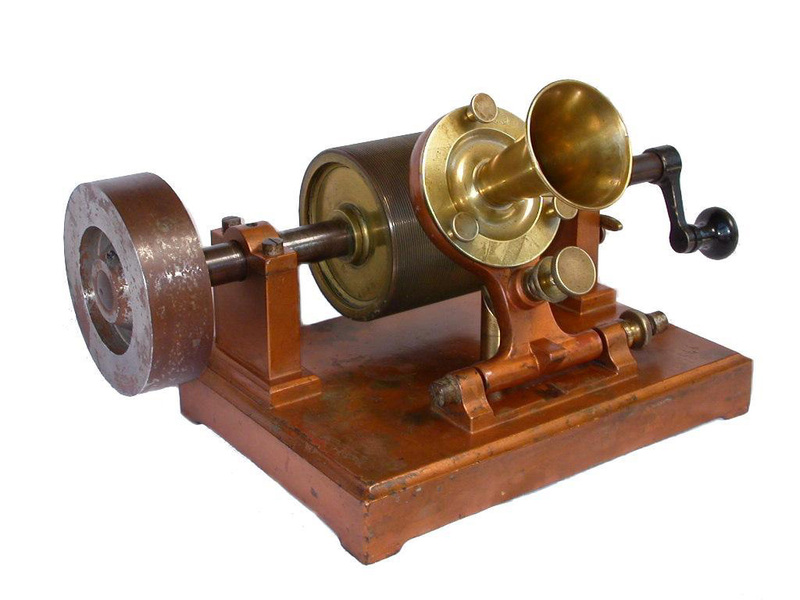 Ducretet tinfoil phonographs were made for many years, both for entertainment and for scientific research. The earliest examples, including the phonograph illustrated here, were marked simply "E. Ducretet." After incorporation in the early 1880s this was changed to "E. Ducretet & Cie.," and in 1885 to "Ducretet et Lejeune." This particular machine is very unusual in that it has a heavy flywheel to help keep the speed consistent. This flywheel is clearly original and not a later addition since the shaft is longer than on conventional Ducretet phonographs, to accomodate its size. Only one other Ducretet phonograph with a flywheel has been reported.